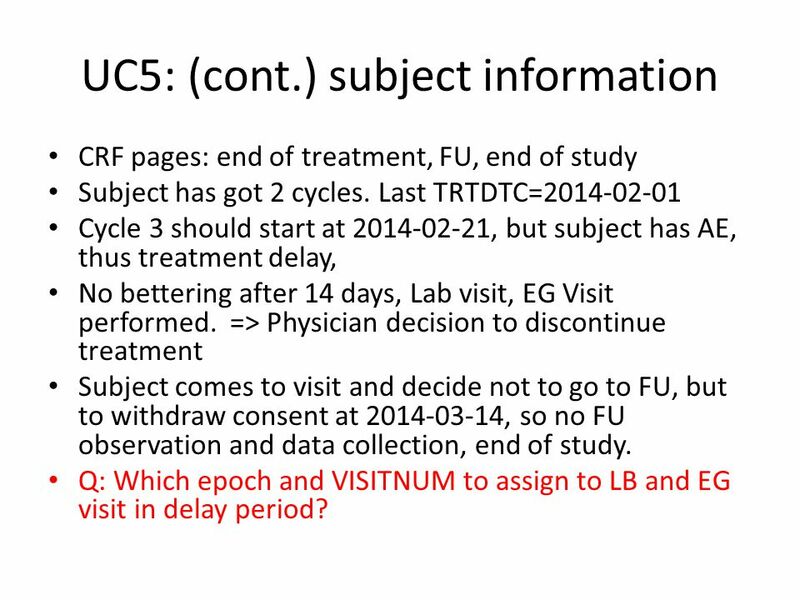 CRF pages: end of treatment, FU, end of study Subject has got 2 cycles. 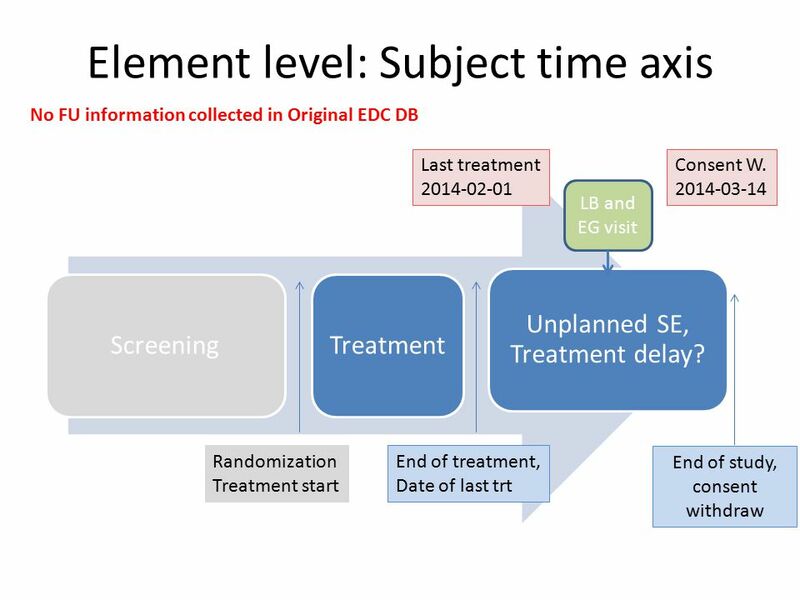 Last TRTDTC= Cycle 3 should start at , but subject has AE, thus treatment delay, No bettering after 14 days, Lab visit, EG Visit performed. 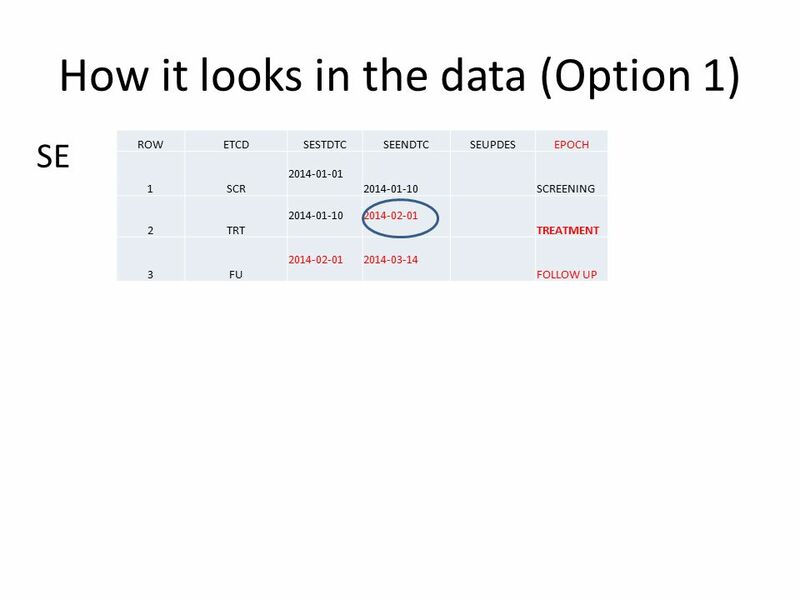 => Physician decision to discontinue treatment Subject comes to visit and decide not to go to FU, but to withdraw consent at , so no FU observation and data collection, end of study. Q: Which epoch and VISITNUM to assign to LB and EG visit in delay period? 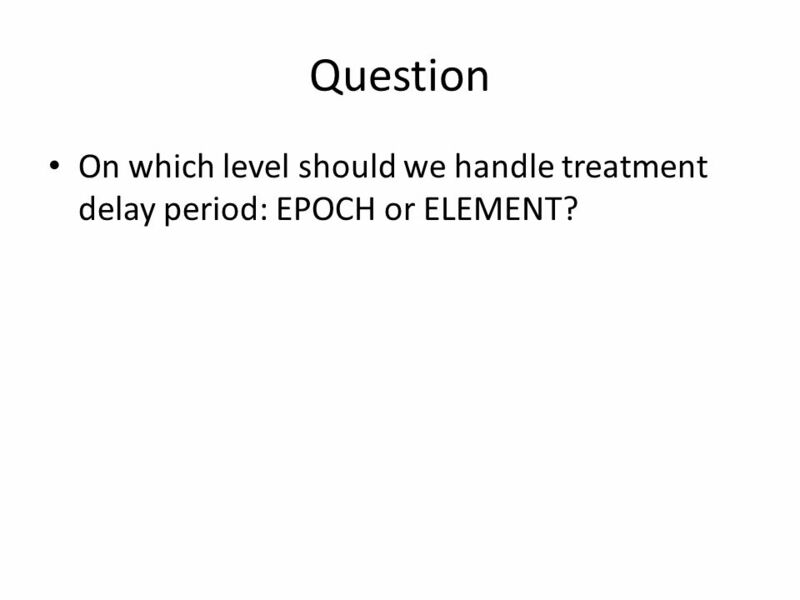 3 Question On which level should we handle treatment delay period: EPOCH or ELEMENT? 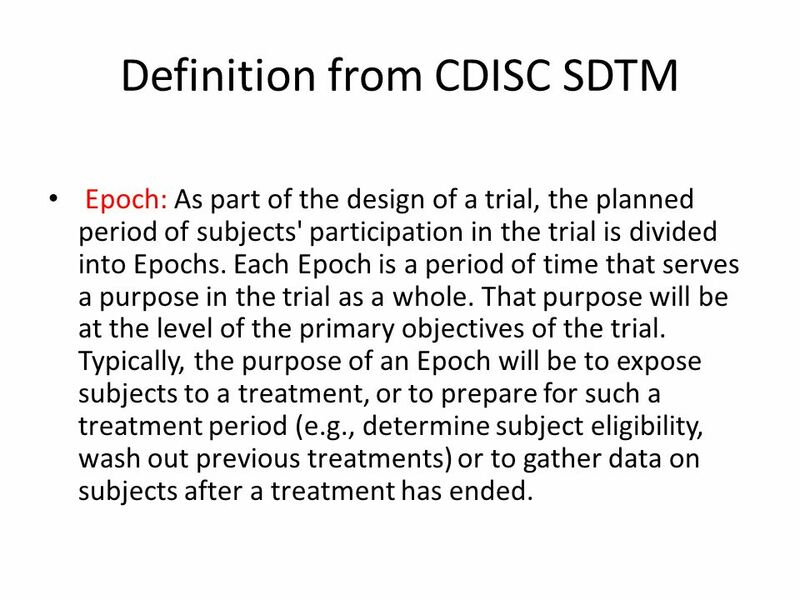 Epoch: As part of the design of a trial, the planned period of subjects' participation in the trial is divided into Epochs. Each Epoch is a period of time that serves a purpose in the trial as a whole. That purpose will be at the level of the primary objectives of the trial. 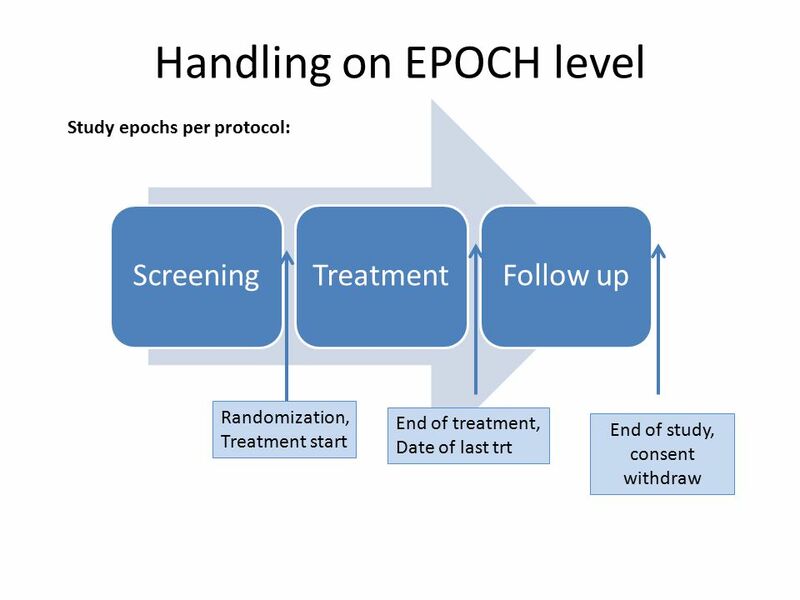 Typically, the purpose of an Epoch will be to expose subjects to a treatment, or to prepare for such a treatment period (e.g., determine subject eligibility, wash out previous treatments) or to gather data on subjects after a treatment has ended. Element: An Element is a basic building block in the trial design. It involves administering a planned intervention, which may be treatment or no treatment, during a period of time. 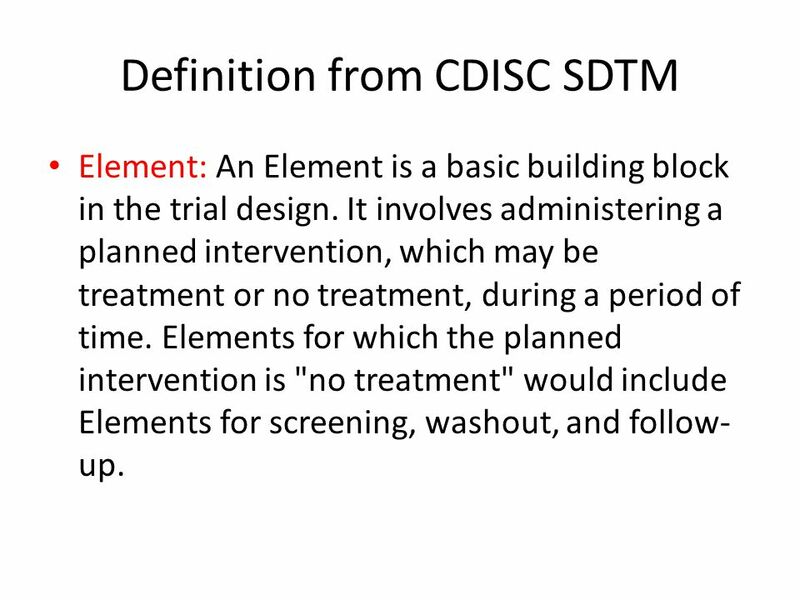 Elements for which the planned intervention is "no treatment" would include Elements for screening, washout, and follow-up. 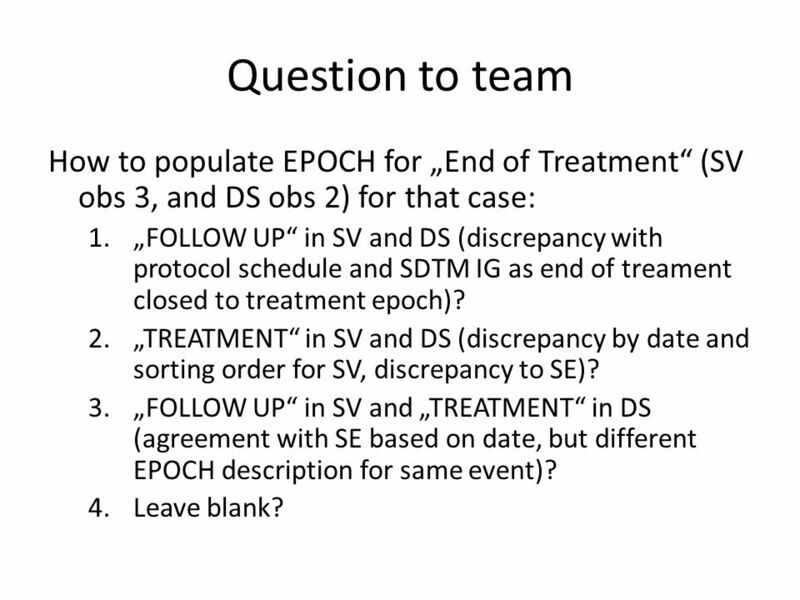 11 Question to team How to populate EPOCH for „End of Treatment“ (SV obs 3, and DS obs 2) for that case: „FOLLOW UP“ in SV and DS (discrepancy with protocol schedule and SDTM IG as end of treament closed to treatment epoch)? 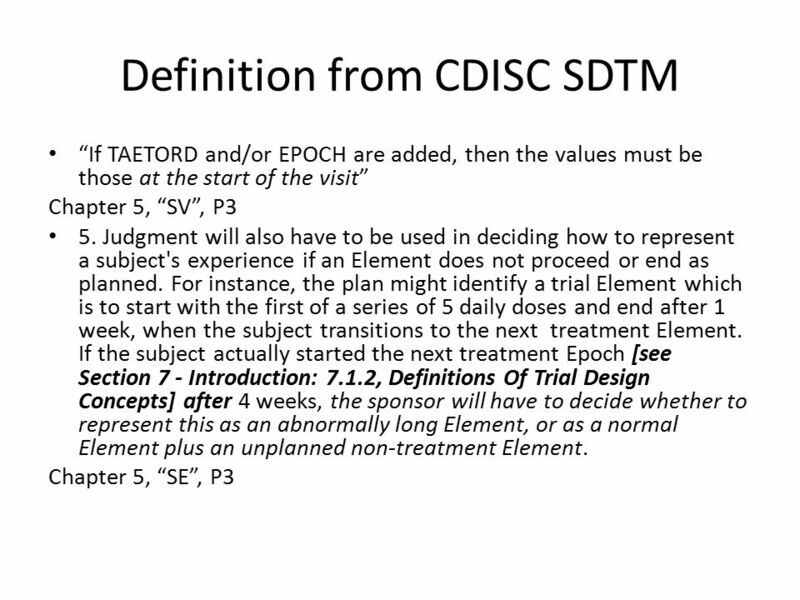 „TREATMENT“ in SV and DS (discrepancy by date and sorting order for SV, discrepancy to SE)? 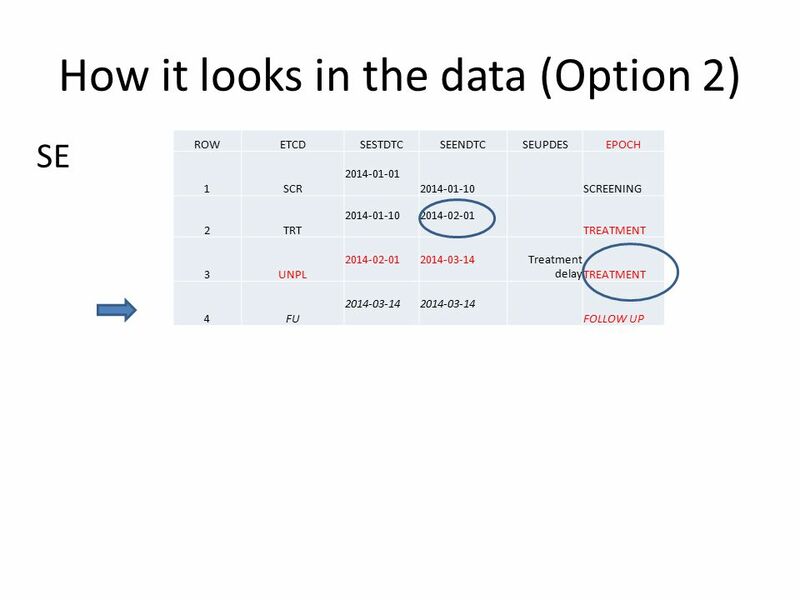 „FOLLOW UP“ in SV and „TREATMENT“ in DS (agreement with SE based on date, but different EPOCH description for same event)? Leave blank? 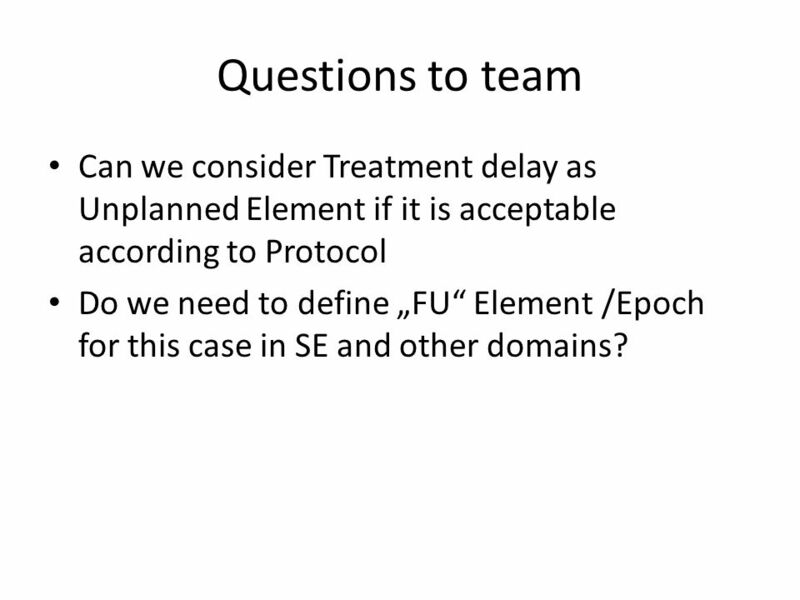 15 Questions to team Can we consider Treatment delay as Unplanned Element if it is acceptable according to Protocol Do we need to define „FU“ Element /Epoch for this case in SE and other domains? 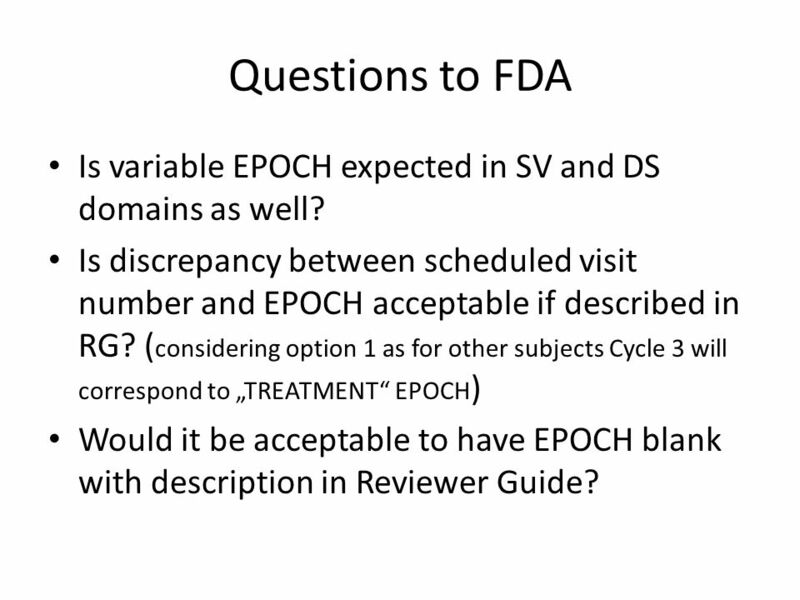 16 Questions to FDA Is variable EPOCH expected in SV and DS domains as well? 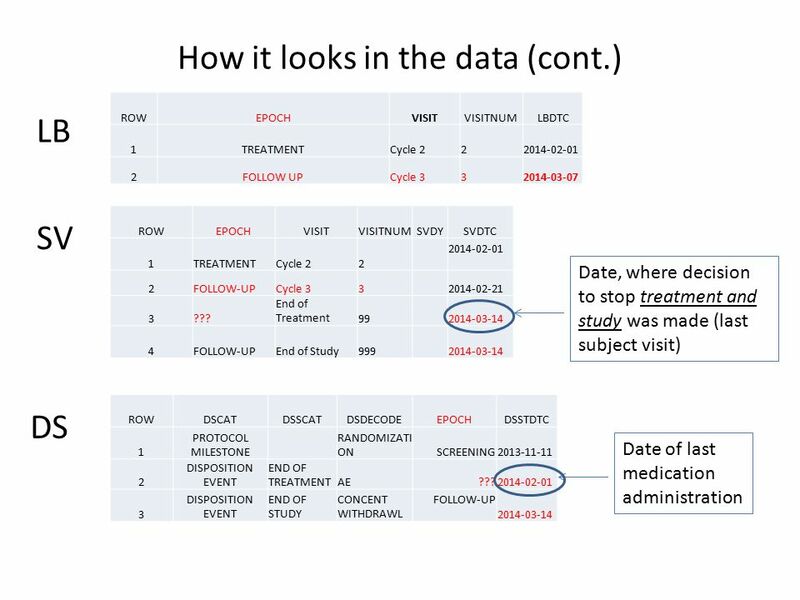 Is discrepancy between scheduled visit number and EPOCH acceptable if described in RG? (considering option 1 as for other subjects Cycle 3 will correspond to „TREATMENT“ EPOCH) Would it be acceptable to have EPOCH blank with description in Reviewer Guide? 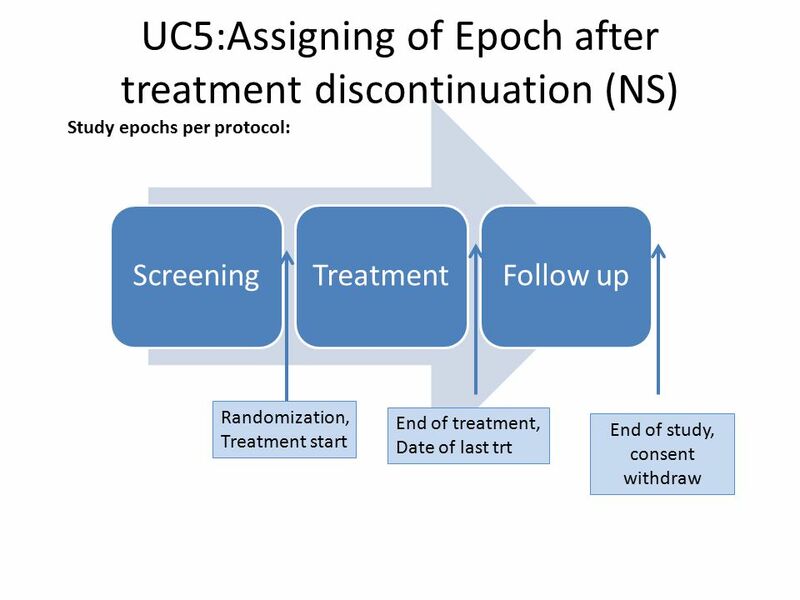 Download ppt "UC5:Assigning of Epoch after treatment discontinuation (NS)"
Elke Sennewald, 22 September 2011 Trial Design Introduction. G ENITAL B LEEDING ASPIRE SSP Section Updates 31 January 2014. An Introduction to Clinical Data Acquisition Standards Harmonization (CDASH) Loryn Thorburn © 2010 PAREXEL International | Confidential. David Cloutier Director, Research Center Management and Development Budgeting for Industry Sponsored Clinical Trials. Biostatistics - Concepts Tudor Calinici – JPEMS 2014. ADaM Standards Wouter van Wyk. Why ADaM –SDTM purpose is to provide collected data Not designed for ease of analysis –ADaM purpose is to provide data. Chapter 11: Sequential Clinical Trials Descriptive Exploratory Experimental Describe Find Cause Populations Relationships and Effect Sequential Clinical.